We had the usual 10:30AM Sunday brunch, which allows the cook and kitchen help to rest. As usual, John Schutt (HMP camp manager) was up early taking care of the camp. After brunch, Drs Robert Ferl and Anna-Lisa Paul (both faculty at the University of Florida) along with Kelsey Young and Byron Adams (both in the Geology Dept. at ASU), went to Drill Hill, Gemini Hills and Planet of the Apes Valley to conduct research, and were back in time for dinner. Their traverse was supported by Ben Audlaluk from Grise Fiord. The Arthur Clarke Mars Greenhouse team will be in operational mode tonight, running a two day test of the system where they won’t touch anything and just let it run. The two day operational mode will test the changes implemented this year as they get ready for their departure in a few days. Hamilton Sundstrand’s new suit port concepts will be interfaced into the Mars-1 HumVee Rover again this season and tested in the next few weeks. The idea of suit ports is that rather than going through an airlock, one can step into the spacesuit through the backpack and be outside within minutes. Led by Dr Matt Deans, the NASA Ames K10 robot team had a productive day. Vinh To set up the computer, Susan Lee got the K10 robot set up with help from Dr Hans Utz, Dr Trey Smith did the software checkout and Eric Park set up networking for the robot. The team ran some tests, moved the robot around and surprised passers by with the robot’s Pac Man sound cues. Dr Valerie Myers (NASA JSC) collected saliva samples this morning from some lucky volunteers. She is conducting a viral reaction study with the microbiology group at JSC. The idea is that during space flight an astronaut’s immune system is suppressed and the virus can be found being shed in the saliva. Outbreaks are rare, but it can be debilitating for long duration flights. The team wants to find out why it happens and learn how to keep it from happening. Moffett Field, CA and Vancouver, BC, 18 April 2010 – An international team of researchers led by Mars Institute scientist Dr. Pascal Lee successfully reached Devon Island, High Arctic, on Sunday, 16 May, 2010 after a 13-day, 150 km vehicular journey from Cornwallis Island to Devon Island, along the fabled Northwest Passage. The Northwest Passage Drive Expedition team of six departed Resolute Bay, Nunavut, on 5 May aboard the Mars Institute’s Moon-1 Humvee Rover and two snowmobiles. After encountering several days of immobilizing snowstorms and extremely rough sea-ice conditions, the team finally reached the west coast of Devon Island late in the evening of 16 May. The Mars Institute’s Moon-1 Humvee Rover on solid ground at Domville Point, Devon Island, in the evening of 16 May 2010. “It’s both a great joy and a relief to get our Moon-1 onto solid ground on Devon Island” said Lee. “This final sea-ice crossing was quite a challenge, but we had a fantastic team and vehicle, and we just kept working at it”. Accompanying Lee were Mars Institute crew members Joe Amarualik, John W. Schutt, and Jesse Weaver, and the Jules Verne Adventures documentary team comprising filmmaker Jean-Christophe Jeauffre and director of photography Mark Carroll. The primary goal of the Northwest Passage Drive Expedition is to transfer the new Moon-1 to Devon Island, a location known to present unique scientific and operational similarities to the surface of the Moon and Mars. There, the rover will be used as a concept vehicle simulating future pressurized rovers to be driven by humans to explore other planetary bodies. 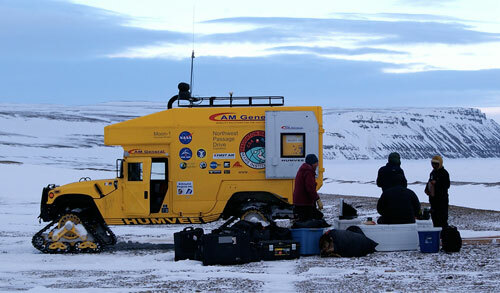 The expedition is an integral part of the Haughton-Mars Project (HMP) on Devon Island where research in space science and exploration is being conducted by the National Aeronautics and Space Administration (NASA), the Canadian Space Agency (CSA), the Mars Institute, the SETI Institute, and other partnering organizations. Last year, Lee’s team logged a record-breaking drive of 494 km in the Moon-1 along a western section of the Northwest Passage, the longest distance ever driven on sea-ice in a road vehicle. This year, the team applied the same winning strategy to avoid the roughest areas of sea-ice along the Wellington Channel. It used a variety of radar satellite remote sensing data and its own surface reconnaissance by snowmobile to find the smoothest possible ice route between Abandon Bay, Cornwallis Island, and Domville Point, Devon Island, where the Moon-1 is now safely parked. The next step will be to drive the Moon-1 overland to the Haughton-Mars Project Research Station on Devon Island later this summer, where it will be used to begin long-range dual pressurized rover exploration studies. “The arrival of the Moon-1 on Devon Island ushers in a new phase in our space exploration work that will be critical to enabling humans to explore other worlds sooner, more safely, and more productively” remarked Lee.